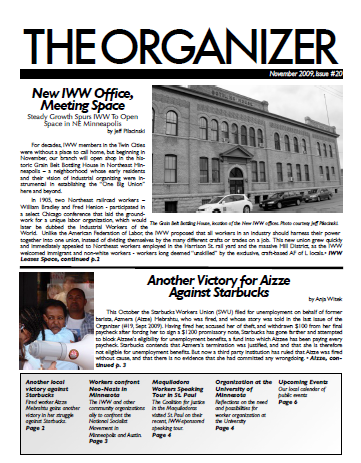 November 2009 PDF of the Twin Cities IWW branch's newsletter. Fired worker Aizze Mebrahtu gains another victory in her struggle against Starbucks. The IWW and other community organizations ally to confront the National Socialist Movement in Minneapolis and Austin. The Coalition for Justice in the Maquiladoras visited St. Paul on their recent, IWW-sponsored speaking tour.